Oocyte released from ovary about the midpoint of the menstrual cycle. 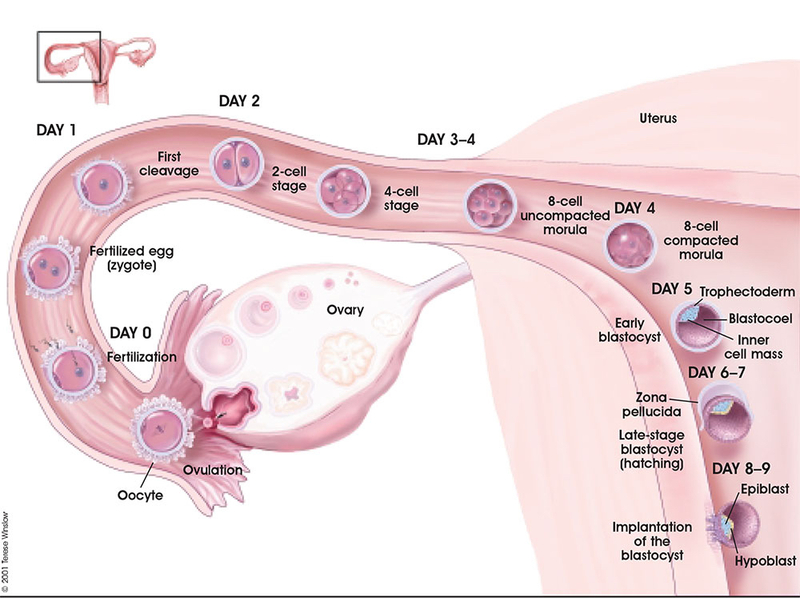 Day 0 - Ovulation/Fertilization The haploid oocyte and spermatozoa fuse at fertilization to form a diploid zygote, the first cell. Fertilization occurring generally in the first third of the uterine tube (uterine horn, fallopian tube). Day 1 to 3 - Cell division by mitosis forming a solid ball of cells, the morula. Day 3 to 5 - Cell compaction forming a fluid-filled space and two cell populations, the blastocyst (1-chambered conceptus). Day 5 to 7 - blastocyst "hatches" from the surrounding zona pellucida. Day 7 to 9 - Implantation commences and continues through the second week of development.